Bumblebees, their conservation, behaviour and decline are important research areas within the University of Stirling’sÂ School of Biological and Environmental Sciences. Bumblebee survival is of increasing concern andÂ Penelope Whitehorn,Â a Ph.D student in the School, has recently been discussing the threats to Bumblebee populations,Â see the BBC News website. We have lots of information and resources for you to research this topic too. You can read aÂ journal article co-authored by Penelope, ‘Impacts of inbreeding on bumblebee colony fitness under field conditions’ in STORRE. 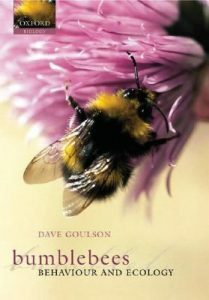 Various books about bumblebees and other bee species are available from the LibraryÂ includingÂ Professor Dave Goulson‘s book, Bumblebees : their behaviour and ecology. Dave Goulson is Head ofÂ School for the School of Biological & Environmental Sciences and also a trustee of theÂ Bumblebee Conservation Trust which has established a Bumblebee-friendly gardenÂ within Stirling University’s grounds! The trust has been voted Best Environment Project at the National Lottery Awards 2010. Congratulations!